I'm a Winner! Bromide Prize Cards Galore! It's safe to say I lucked out with this lot. Three bromides, all premium prizes. One of them is uncataloged, even! First, this is JBR 9a: 1950-51 Large Black & White Marutoku 3rd Prize. Except for size, these are basically the same as JBR9. The regular cards measure 1-9/16" x 2-1/2", while this 3rd Prize version is 2-5/8" x 3-5/8". There is a 2nd Prize larger version (3-9/16" x 5") and there must be some first prize as well. Engel's guide mentions a color variation for the regular set, but not the prizes. Furthermore, there are two more sets issued by Marutoku in 1951 which are wider than JBR 9, though he doesn't mention any prize parallels. The player above is Shigeru Chiba of the Yomiuri Giants. The top line mentions the league and team name, while the bottom line is the player's name. The backs are blank. Also issued in 1950, this is JBR 87c: Bromide Game 2nd Prize Premiums. The JBR 87a set has several variations in ink color - my card is black and white, but brown and green ink versions are known as well. There are also game cards with a baseball play (hit, double, triple, home run) instead of the regular text at the bottom - these variations are prize cards; a hit brought a 4th Prize, double 3rd Prize, and so on. JBR 87a measures 2-1/16" by 2-3/8". Engel doesn't mention any 4th Prize premiums, and based on my experience I'm guessing 4th Prize was just another regular bromide. 3rd Prize are larger - 2-15/16" by 4-1/16". The card you see above is a 2nd Prize, at 4-7/8" x 6-7/8", which makes it a good bit larger than a postcard. That would make it perfect for displaying on a kid's wall. The player above is Hiroshi Ohshita (or Oshita) of the Flyers. The text line has the player's name followed by the team nickname in parentheses. Finally, the uncatalogued card. Does this look similar to the card above? It should, because I believe this is the First Prize (or home run) card for this release. The player is Fumio Fujimura of the Tigers, and the photo shows him diving into what I believe is home. This card is described in the 2nd Prize and regular set as well, and it's such a good photo I'm not surprised it would be used as a 1st Prize as well. It measures about 8-3/8" by 10-1/4". Both my 2nd and 1st Prize cards from the 1950 Bromide Game set have tape/glue remnants at the top on the back. This could have been from the owner displaying it in a book or on a wall, but given how bromides were sold, these could have been attached to the packaging/display for the bromides. I haven't shown many lately, but there are several unidentified Japanese cards in my collection. Here's one of my newer ones. Much smaller than the usual menko cards, this little guy has a color photo over an exploding background. Given what I saw when I bought this one, other cards might just have regular photos. The backs have the same usual stuff as found on other menko, but the order is somewhat unique. The menko number is in the middle, with the janken symbol at the bottom and a robot cartoon above. I'm not sure if the other cards I saw had robots or some other art. Given the quality and the card stock, I would guess this is post-1960. A prime example of the recycling of card designs comes in the Bat on Right series. Issued by Marukami from 1959-64, the seven series of cards measure 1-13/16" by 3". It's so standard as a Japanese menko that it's nicknamed "J206" after the famous T206 tobacco series. It's the most commonly seen, about the same size as T206, and there are a few back varieties. Those varieties usually come in back color variations and variations in card stock. Several cards from these series were imported to the US, and those cards are frequently numbered with a stamp or by hand by the importer in a more traditional manner (1, 2, 3...). This is common for several sets that were brought to the States in the 1960s. There are seven distinct series that Engel has included in his guide as complete listings; he mentions that types a-d (the earliest series) are scarcer than the last three. Fronts of JCM 14 have vertical kanji with the player's team and surname. 14a includes the position, while 14g includes the position but no team name on the front. In some cases, as with 14e seen here, the team name is in parentheses. Cards from all series have color photos on the front and white borders. The backs are printed in one color, but that color can differ by series, and some series have multiple colors. The set gets its name from the large bat on the right side, with a janken symbol beneath. The top line lists the team name, while in 14f it includes the player name and team name. Various information about the player is found in the middle, and a menko number is printed at the bottom. Menko numbers can be repeated in a series, which is very visible in my uncut sheet above. Furthermore, those numbers are repeated from series to series, and some players have the same number from series to series as well. This can make it difficult to identify cards at times, but each series has its own unique quirks to make it easier to figure out. While these cards define menko sets, and thus are very run-of-the-mill, having an uncut sheet of a scarcer color makes it all the better. I love uncut sheets, so this is a great addition to my collection! As far as most of you can tell, menko are pretty standard - image on the front, game stuff on the back. And these cards are no different in that respect. But one thing you don't usually see, and I never really mention, is that menko are generally very thick. Some of the die-cuts I have are thinner than the rectangular ones, but they still are thicker than the Allen & Ginter cards sitting beside them. This is because menko is a game, and cards are designed to be tough, so they last in battle and actually fly like you want them to. Bromides are much thinner. Some are basically the same thickness as photo paper, though most are pretty standard in their thickness. Also, while not necessarily the case every time, bromides get their name from the photographic process originally used to make cards. So when it comes to cataloging a card, not only the design but the thickness and manufacturing techniques come into play. While more menko sets have been released for baseball than bromides, you can still find the modern version of bromides in various entertainment industries. What translates as "life photographs" are extremely popular for many idol groups; some AKB48 photos can sell for hundreds of dollars! I've also seen similar products offered for some baseball products. The cheerleader team box sets BBM has issued over the past few years have included these as box toppers, and I've seen some teams issue larger bromide/life photograph style products. Furthermore, bromides can be found in some snack shops for popular music groups. This is JBR 5. Issued in 1959 by Marukami, the name of the set refers to two cards being attached to each other. The combined cards are 2-3/4" by 2-1/8". The player on the right is Yosio Yoshida of the Tigers. While this is a 1959-designated set, my The History of Uniform book identifies that cap logo as belonging to the 1960 uniform. It's possible that the book could be wrong about the cap change date. The player on the left is Yoshikazu Hamanaka, of the Whales (I think - determined by his hat logo and pose). The same book identifies his uniform as being from 1960 as well; the Whales didn't use jersey numbers on their fronts until that season. It's possible this set was issued in 1960 or the uniform book is incorrect. The back of each card has a playing card number and symbol as well as an animal, along with a janken symbol at the bottom. The backs don't match to specific fronts, as each front could have any playing card symbol on the back. The set has 60 baseball cards plus many actors and actresses. Regular cards came sold uncut in pairs, but there are display sheets with 4, 12, and 32-card layouts. Iroha karuta, or just karuta, is a game that has its roots in Japan from over 400 years ago. Based on a Portuguese game brought over in the late 1500s and early 1600s, when they were trading in Nagasaki, karuta has pairs of cards. Each pair consists of a picture card and a reading card; both cards share the same hiragana character. There are several ways to play the game, but one common way is to place all the picture cards face up, and deal the reading cards to the players. Each player reads one of their reading cards, while the other players try to pick up the correct picture card. I occasionally play variations on this game while teaching English; it and many other traditional Japanese games are still played today by elementary school students! What you see here is a picture card for a karuta game inserted in a December 1952 youth magazine. They were packaged in a box in uncut sheets of four cards, which came with the magazine. The team's name is in the bottom-left corner, while the player's name is printing in hiragana in the upper-right corner. A number (1, 2, 3, 4, or 5) is printed in a circle at the bottom right. These numbers could have been used for other purposes - playing a game, or as points. Reading cards have the player's name and information printed in Japanese text, surrounded by a border with lots of different sports equipment and a flag. Backs of all cards have a design like you see above. As the pictures are color pastel drawings, the images are nice. Finding a full set probably isn't easy or cheap, partly because the set includes Wally Yonamine, a popular foreigner, and Masaichi Kaneda, considered one of the best pitchers of all-time in Japan. Of course, other popular players of the era appear in the set. My card above is of Chusuke Kizuka, definitely a common baseball player from the set. He is a member of the Hawks. That isn't to say that he was a bad player - Kizuka was a six-time All-Star, hitting over .300 a few times in his career; he also was pretty good on the basepaths, ranking in the top 5 all-time. His career batting average was .262 and he managed 479 steals in 593 attempts, which gives him the best percentage of those in the top-five SB category. His success as a base stealer certainly is the reason he is depicted sliding in his card above. The JK20 set contains stars from all sorts of sports - university and professional baseball players, ice skaters, swimmers, judo and discus stars all appear in the set. This is in contrast to JK19, which only has baseball players. Note: this post was edited thanks to SumoMenkoMan's comment (see below). I originally had this labeled as JK20, and changed my mind while writing this post - but thanks to him I know I was right in the first place. As SumoMenkoMan mentions, JK19 has a different font and (I couldn't notice this when I looked at the image in the first place) parenthesis around the team name in addition to the position in the lower left corner. Do you remember Five for Fighting? Yeah, that's them. They make it into today's post because below, I give you five cards originally created for fighting. Menko is a game similar to Pogs, where the players throw their menko cards at their opponents' to get them to flip over. Other games are found on menko cards - janken, which is rock-paper-scissors, numbers which can be used for math-based or other number games, playing card suits and numbers, and quizzes are all pretty common. As a side note, a lot of game terminology in Japan has its origins in fighting or war. The first die-cut is this Hawks player. Similar to other menko I've shown from the 1940s, this doesn't specify any particular player but the back does mention the team name. It's uncataloged, most likely due to the lack of any players. This next card is also uncataloged. It has a different design which hints that it comes from a different release. There is no menko number on this card, nor are there janken symbols or other text for standard menko games. On the back, the kanji in the middle translates as referee, referring to the umpire found on the front image. The baseball says "out" which indicates that having several of these cards could possibly lead to the simulation of a baseball game. Ahh, glasses. Kaoru Betto is one of the most recognizable players of the past thanks to his trademark spectacles. This card is from the JDM 21 1949 Hoshi Gangu Diecuts set, easily identified by the team name at the top and Hoshi Gangu star logo on the right. The center text is the player's name; the menko number is at the bottom in the banner. These glasses don't belong to Betto; this is Tadayoshi Kajioka, whose name is in the yellow circle on the front. This set is JDM 19 c. 1949, and called Large Brown Number Background for obvious reasons. A janken symbol is at the top and a baseball outcome (right fly - a fly ball to right field) is at the bottom. 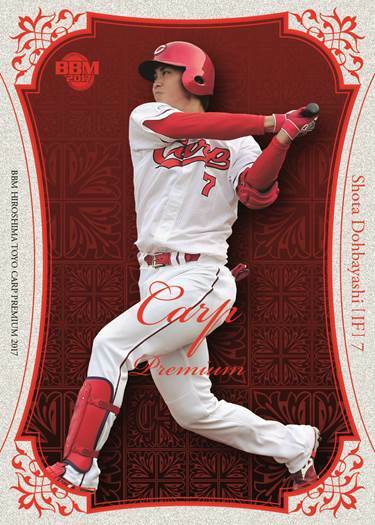 Finally, we go back to 1947 for JDM11: Card Number in Circle. I would guess that this is the earliest sequentially numbered baseball card set issued in Japan. Other card sets may have unique numbers, but those aren't sequential; Karuta cards come close, being "numbered" using the Japanese alphabet. Card 2 is Hiroshi Oshita. The first 10 cards are professional players while the last 8-10 cards (#12 and #20 aren't known) are university players. There you have it! Five cool die-cut menko cards from nearly 70 years ago! Most people shy away from odd-sized cards. Topps Big and 1989 Bowman don't fit in normal pages properly, and they were fairly large releases. And Topps' mini cards don't do so well either; the tobacco minis have dedicated pages but those other minis can be tough. And then you can add in other oddballs - postcard-sized cards, round cards (Fleer Hardball), Goudey, and all of those other odd releases from the past. I love that stuff, though. I want all the Topps Mini sets from the 1980s and the recent throwbacks too. I have the '89 Topps Big set. They're not the easiest things to store with the rest of a collection, but they are fun to have. The 1960 Oh & Nagashima Menko set is truly oddball sized. The set of four cards have identical designs - the player's surname is in a colored box, a menko number and a playing card also appear over the posed color photographs. Backs are blank. However, this four-card set comes in four different sizes. The smallest card goes to Nagashima, at 2-1/16". The two Oh cards are 2-7/16" and 2-15/16", while the final Nagashima, seen above, is a massive 4-1/4" wide. Given that the set includes four different-sized round cards, my guess is that the "set" was printed on a single sheet. This is purely speculative, but makes some sense, because many menko sets needed to be cut or punched out from a full sheet. Variations have existed almost as long as trading cards have. The first notable variations were probably Old Judge photo variations, which date back to one of the first trading card sets! Many (most?) people, including me, consider those unique cards, though. However, jump ahead a couple decades, and the Big Tobacco card sets, such as T206, are well known for their different advertising backs. These days, variations are a marketing gimmick, but back then, they were just circumstantial. And looking at Japan's card history, there are similar ... um ... circumstances. Menko cards have come with a wide variety of variations. Back in the 1950s and 1960s, menko was a game and the fronts weren't so important. Different backs meant different games that could be played, which resulted in some card fronts being found with different style backs. And the opposite - recycling backs - meant that less time could be spent on designing the backs, and manufacturers could just churn out a new series of the latest popular stars with half of the effort. Similarly, I'm sure printing methods resulted in intentional mixing of backs and fronts in some series. But beyond that, menko cards seem to frequently come in a variety of basic styles on a theme. Again, recycling concepts saved time at the drawing board. Take the round menko set JRM 1 and its five cousins. One of the earliest pro baseball menko sets, JRM 1 was issued in 1948 and features 12 cards which are 2-11/16" in diameter. The tops are red, the bottoms are green. This set has a variation which indicates that it may have been reprinted. Specifically, there are no parentheses around the team name, and the line between the two background colors is yellow instead of black. A little earlier than JRM 1 is JRM 1a, issued in 1947. The only real difference in design is the font, though these are a bit smaller. Again, this set has a variation in that it was issued in two different sizes (1-7/8" and 2-1/4" diameters). Also in 1947 is JRM 1d, where the cards are larger than JRM 1a (but smaller than JRM 1), at 2-3/16" diameter. Then, in 1950, a couple more sets with this design were issued. JRM 1b has two types, both which are the same size as JRM 1 (2-11/16" diameter). The first uses the same background style as JRM 1 (red over green), with black and white photos and more professional-looking text. Type II uses the same photos and text, but the backgrounds are solid blue, pink, or red - with each player having all three variations! Finally, JRM 1c is a larger version of JRM 1b Type I, just larger (3-11/16" wide). All of the sets are at least somewhat rare, but the 1950 sets are tougher to find, with 1c being the most difficult. In some cases, players are found in multiple sets, but the cards aren't all parallels of each other, excepting JRM 1b's Type I, and the three colors for Type II. And not all players in Type I appear in Type II, so it is a partial parallel. Here is a JRM 1c. The player is Atsushi Aramaki, a pitcher for the Mainichi Orions. Aramaki had a pretty successful career over about 13 seasons, going 173-107 with a 2.23 ERA and 1069 strikeouts. This would be his rookie card, as he started playing in 1950. Following his pitching career, he would go on to coach the Braves and Atoms for a combined four-plus years, before passing away on May 12, 1971. I also have a JRM 1 and JRM 1a in my collection, so I have three of the six types so far. The quest goes on! When it comes to trading cards in Japan, gum doesn't get older than this. The earliest cataloged food issue from Japan is the card you see right here. While it's highly possible that there are older cards in existence, the latest issue of Engel's guide has this right at the top in the "Misc. Vintage Food, Candy and Gum Cards" category. Coming in around just 1-1/16" wide and 1-7/16" tall, give or take, these are somewhere around the size of those tiny Topps Micro cards from around 1992. At least five series were issued, or at least types of cards were designed. Type I is the version you see here - I think. This is the easiest to distinguish because "Asayama Fusen Gum" is printed vertically (that's the white box near the top). However, the example in Engel's book has two white boxes, with the player's name appearing in the second box as well. Furthermore, none of the cards listed is the one I have. That doesn't mean it doesn't come from this series, because there are possibly uncataloged cards in this set. Type II has the Asayama Fusen Gum box at the bottom, horizontally, with a border around that box. Type III's horizontal box is also at the bottom, but oval-shaped (possibly without a border?). Type IV has the text at the bottom, but without a box. Finally, Type V features San Francisco Seals players exclusively, and there is a white box at the bottom without a border. The cards are all blank-backed and quite rare, receiving the designation "R5" - the rarest scarcity of known copies. As such, they carry a premium in better condition. I got the card above from a seller who listed several different singles from many of the series, but I was outbid on the other auctions. Still, this is a pretty cool little (really little) card to have! 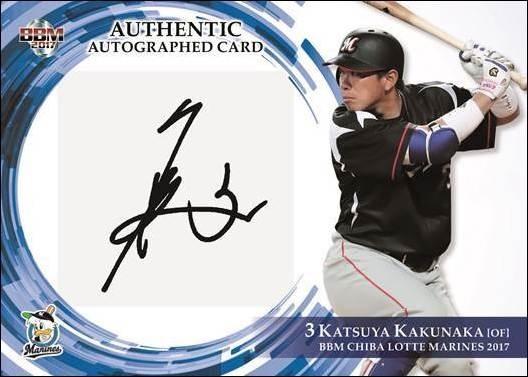 The first installment of Calbee's annual baseball card set hit grocery shelves last month, but with the 30-Day challenge and everything else going on I kind of neglected to post about the set until now. That's partly because I didn't even find it on shelves until about a week ago. However, I got my type collection singles and set before then! The base cards look essentially the same as usual. NPB Card Guy pointed out that the names are in white again after using black text in 2015 and Japanese characters last year. Not having to read kanji and hiragana/katakana makes it much faster for me to flip through cards. But otherwise, the design remains the same as it has been for some time now. There are 72 cards in the regular set. The Title Holder insert uses the Japanese name for the awards, which is kind of different. 23 cards are found in this non-premium insert set. I'm not sure why, but checklist cards always carry a premium despite not being short-printed. I went with the Carp's Central League Championship ceremony shot for my type collection. There are four cards in this set. As for premium inserts, Starcard is back. 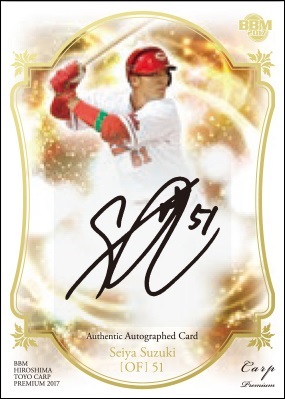 As usual, there are 24 cards in the set as well as a parallel foil signature version. Legend highlights six players this year who retired, including their full career stats on the back. There's a foil signature parallel of this set too. The premium special box card set for 2017 Series 1 is Clutch Hitters. I don't have my type card yet for this set. The cards appear the same as most of Calbee's Special Box sets - the set's title runs vertically up one side in silver foil, and the cards are printed on foilboard similar to BBM's insert cards. The Premium series from BBM seems to setting up as a formulaic release. 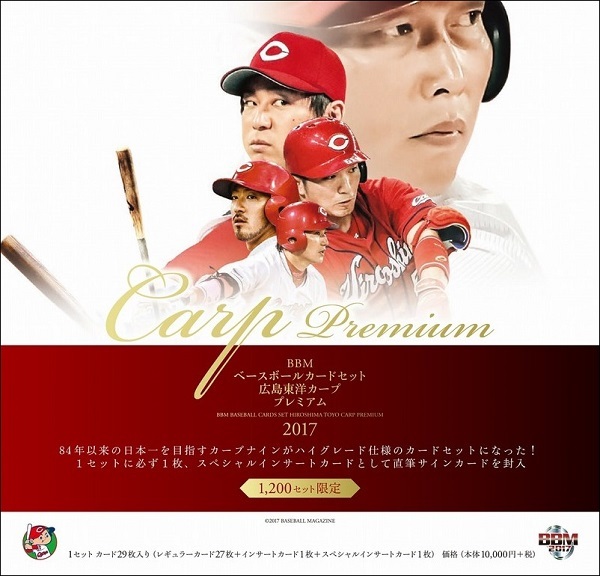 The Carp set is limited to 1200 copies, with the same design as the Fighters cards. The only difference is the color scheme. Each box contains 27 cards plus two special cards. Retail price is 10,000 yen, and boxes hit the shelves at the end of April. Note that I haven't found any singles for my collection yet, so all the images in this post are from BBM. Base cards are red, but similar to the Fighters set. 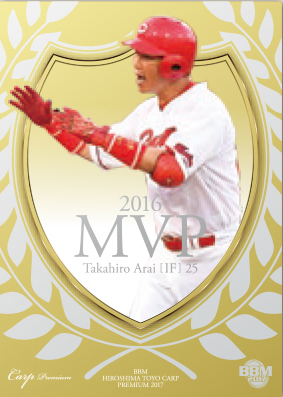 Takahiro Arai has an MVP card in the SP set - there are six cards in total including five Best Nine winners (Arai, thus, appears twice in this insert set). All six cards are numbered to 200 copies each, and one card comes in each box. Finally, autographs for over 60 players are included one per box. Like the Fighters set, they are numbered to 10 or 20 copies each. 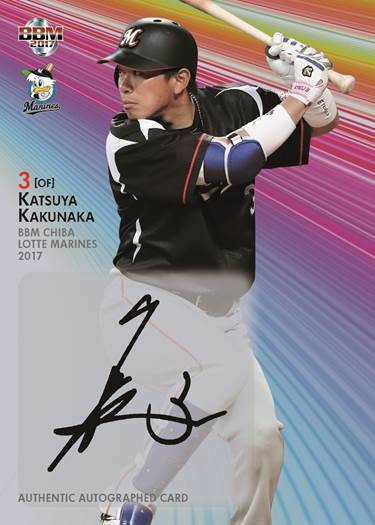 Coming out in late April, the 2017 Marines set is sold 6 cards per pack for 400 yen, and 20-pack boxes are 8000 yen. BBM has standardized the base set size at 81 cards for team sets so far. 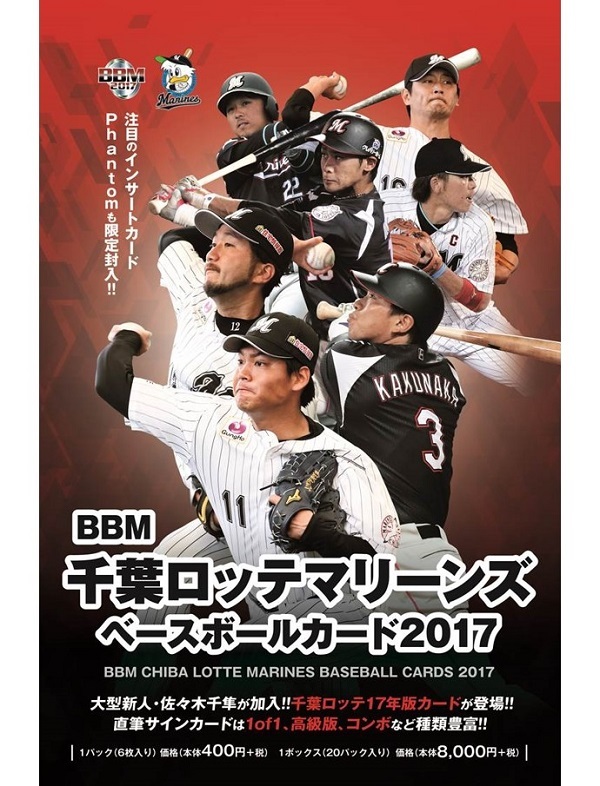 Base cards for the Marines set have white borders; BBM tends to use white with the Marines to match their team colors. The Seawall Quartet subset has four players, unsurprisingly. Backs have team-by-team performance. 2017 New Wave features three new players. The design reminds me of Fleer's Wave of the Future inserts. Finally, Award Winners have four players who led the league in various categories or won awards such as Gold Gloves. The Marines release thankfully has only three insert sets. Each set has parallels numbered to 90, 60, and 30 copies. Additionally, the Marines version of the Phantom insert set has six cards. As usual, every player has an autographed card serially-numbered up to 60 copies each. Two combo signature cards were issued with 5 copies each. Silver Autographs are numbered to 5 or 10 copies each with a 1/1 parallel. There are 9 cards in this set. The seven Rookie Autographs have 5 or 10 copies each, and the Cross Squall autograph set has three cards numbered to 10 copies each. Meet Masanori Murakami in Tokyo!